Raytheon and Phoenix Products have signed an agreement that allows the woman-owned company to receive guidance for the production of missile transport containers under a $1.6M U.S. Navy contract through the Department of Defense’s mentor-protege program. Raytheon said Tuesday it will provide support and training in quality, technical and management processes to help Phoenix Products build transport platforms for the Naval Strike Missile as part of the three-year agreement. “NSM production is bringing jobs and revenue to a growing network of U.S. suppliers, and it is all the more meaningful when the work makes a significant impact in a local community,” Kim Emzen, vice president of air warfare systems at Raytheon, said the production of the NSM will help bring revenue and jobs to U.S. contractors. 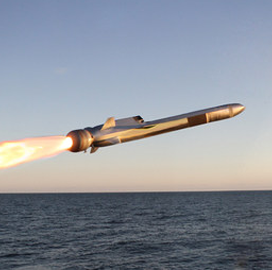 The precision strike weapon system is designed to track and destroy sea and land targets at a range of more than 100 nautical miles. The Navy awarded Raytheon a contract last year to produce and deliver an over-the-horizon weapon for the service branch’s littoral combat ships and future frigates.